So after thinking long and hard I decided on this year’s Epic Halloween Costume! 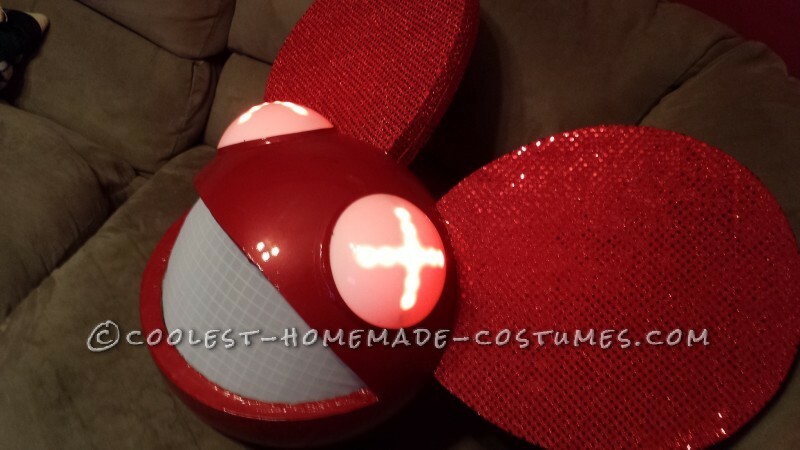 Ive liked Deadmau5 and a couple years ago made a Mau5head and wanted to make another…but wanted to go bigger and better! 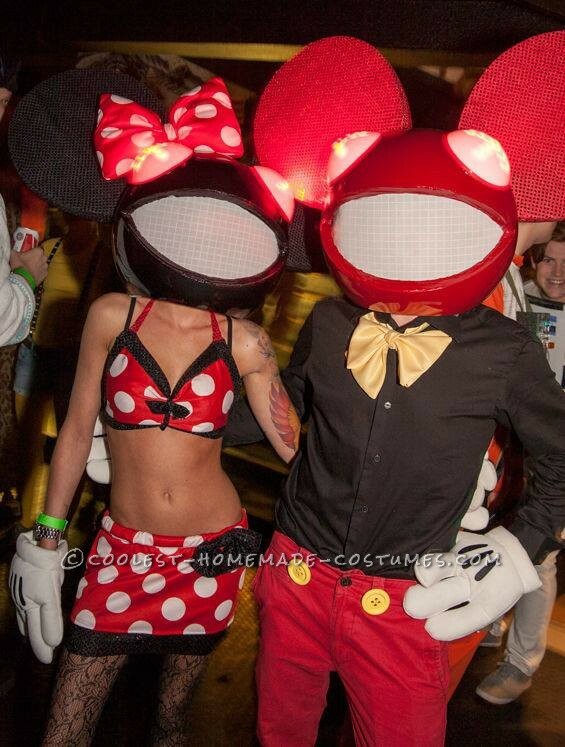 Then I thought everyone loves Mickey and Minnie Mouse…why not make Mickey and Minnie Deadmau5? So after some searching and only finding a few pictures of one couple who had the same thought as me, I got to work and knew I could make mine even more awesome!! 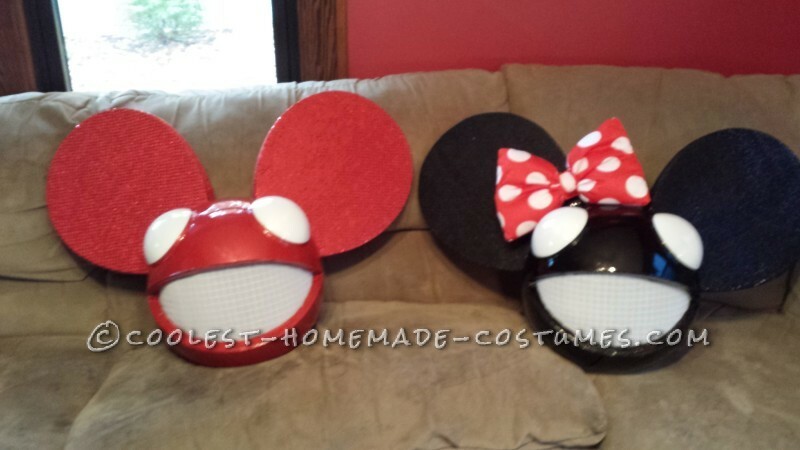 Since there are tons and tons of how to’s on making Deadmau5 heads I will save the boring details and list a few of my materials and how I made mine different from the standard mau5head! I used a 14″ acrylic lamp post globe for the head and a 6″ globe cut in almost half for the eyes. The ears are two peices of 3/4″ paper backed insulation foam wrapped in sequence fabric then glued together with threaded rods in between for mounting to the head. 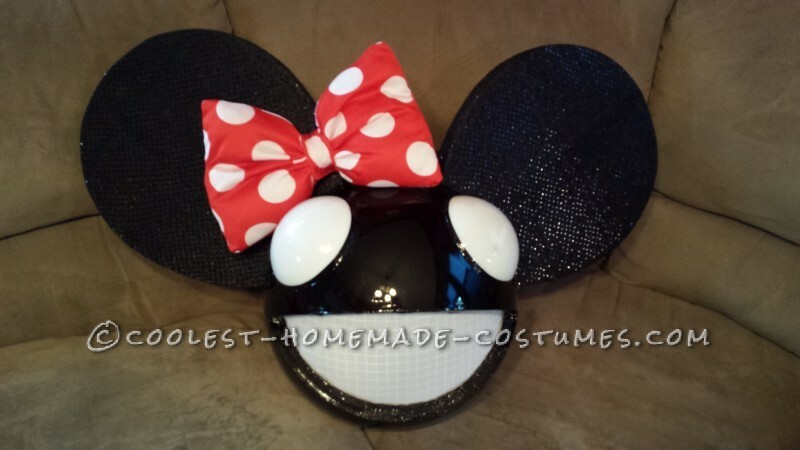 Then unlike the traditional way of making a mau5head I custom painted mine with automotive paint and clear! The inside has a skate helmet and a small computer fan wired along with red L.E.D. strips in X form in the eyes! 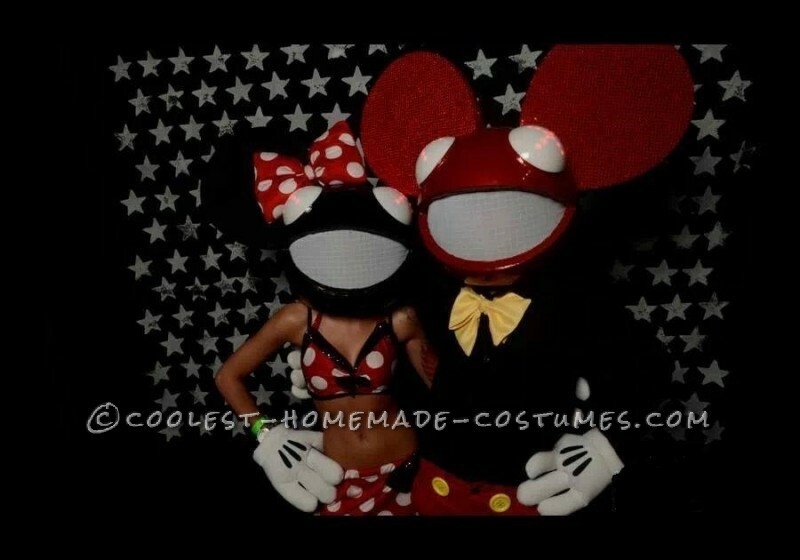 Any other questions on how I made my mau5heads or any part of my costume you can ask by commenting below. 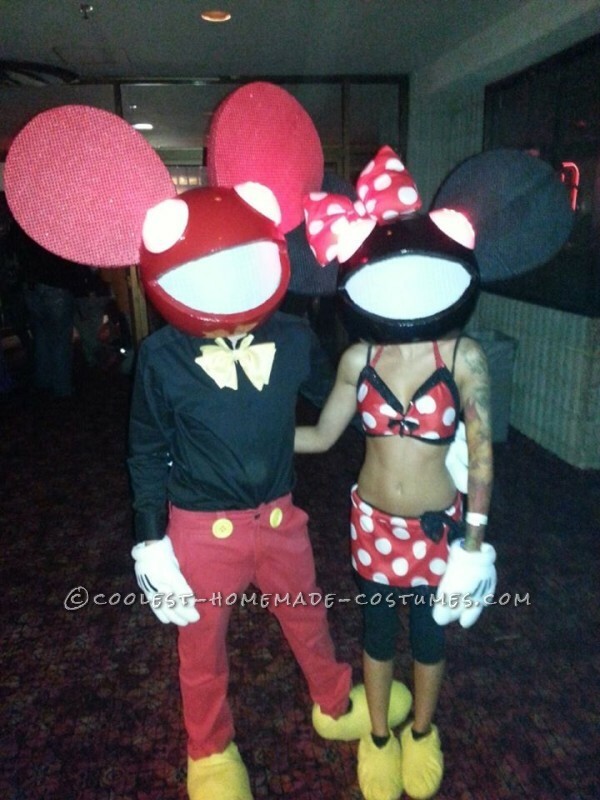 For the rest of the costume I pretty much freehand made everything except for the hands cause I ran out of time or I would have made them and Mickey’s shirt and pants. 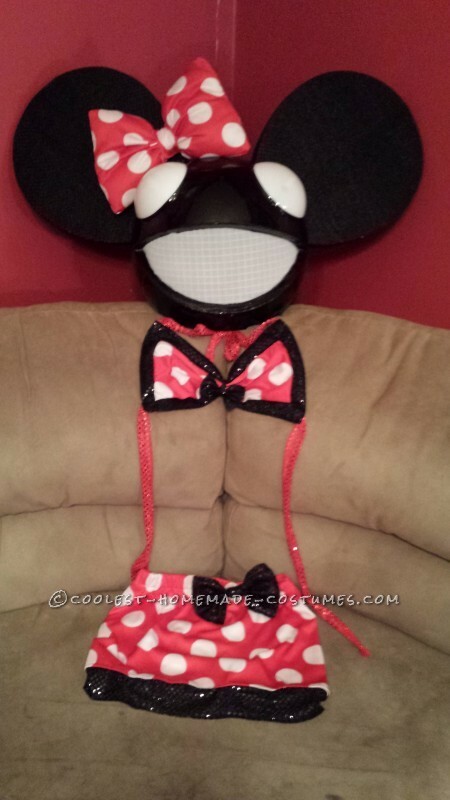 I made Minnie’s entire outfit from scratch, both pairs of feet, my bow tie (which yes, you actually tie like a real bow tie), the bow on the Minnie Mau5head and sewed the buttons on my pants! 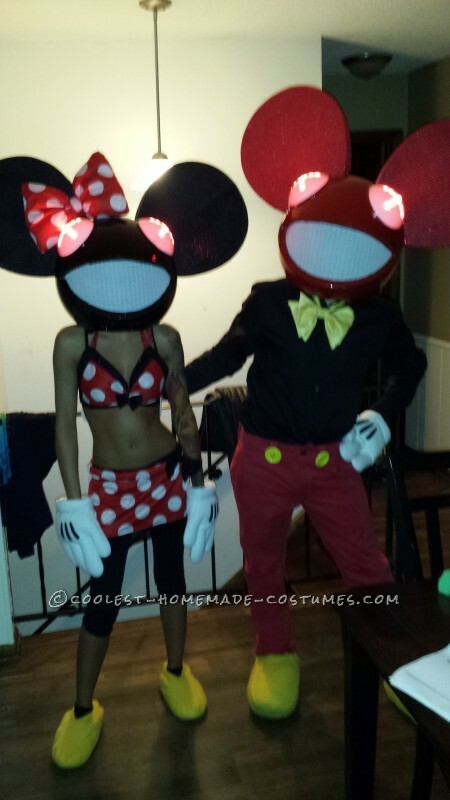 After spending 2 looooong weeks of late nights, some days at work painting and countless trips to Joann Fabrics my awesome Mickey and Minnie Deadmau5 costume was complete and turned out fantastic!!!!! The first night me and my friend Lyn went out was to a dubstep concert/costume party/contest and the only words to describe the night was crazy and insane!! I have never made a costume that has gotten soo much attention in one night!! We were out for about 4 hours and literally hundreds of people were swarming us the whole night wanting pictures! We ended up only enjoying about 15 mins of the concert since we couldn’t even turn around or go anywhere without having our picture taken! I literally felt like a celebrity swarmed by paparazzi!! haha. The whole night we were told we had the best costume there and we better win the costume contest!! We ended up with second even tho everyone after said we should of had first!! But the winner was a female wearing very little clothing so I guess that has the advantage. But it was a great night regardless!! Another night I went out with another friend and we had a great reaction and took second in that contest as well, winning 2 tickets to Electric Daisy Carnival in Vegas!!! We definitely had a better and more creative costume than the first place winner but everyone there loved our costume! Well I think that just about covers this years costume, hopefully I didn’t forget anything!! Thank you all for taking the time to view and read about my costume and hope you enjoy it as much as I did making it and showing it off! 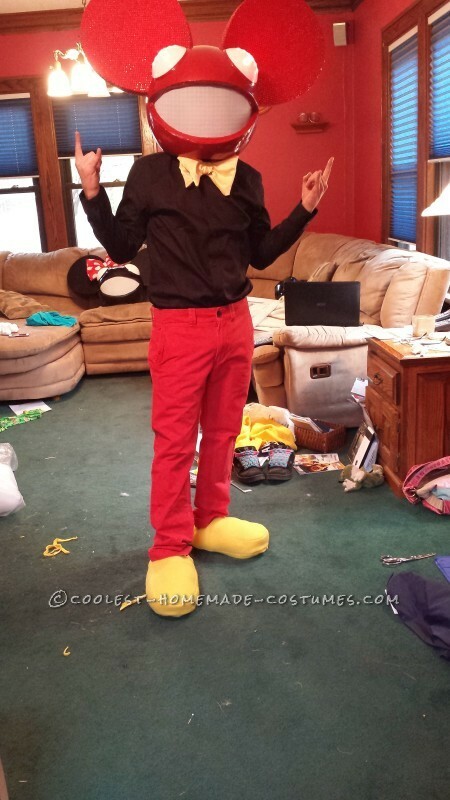 Your costume is awesome! 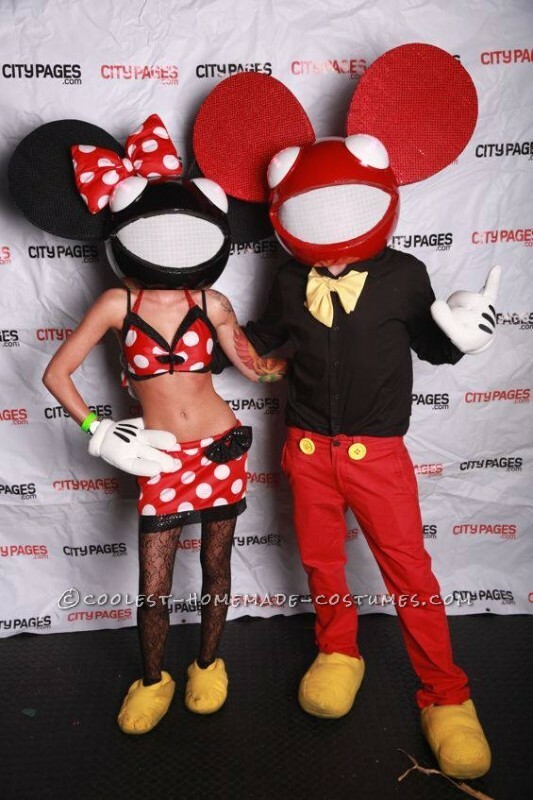 If you’re the same deadmau5 I saw in Mpls a few years ago your costumes ALWAYS make people’s Halloween’s better. How did you attach the fan and LED strips? Were you able to see out of the globe? Did you buy the globe in clear or white acrylic? ?